Neither Marc nor Macke were abstract painters. 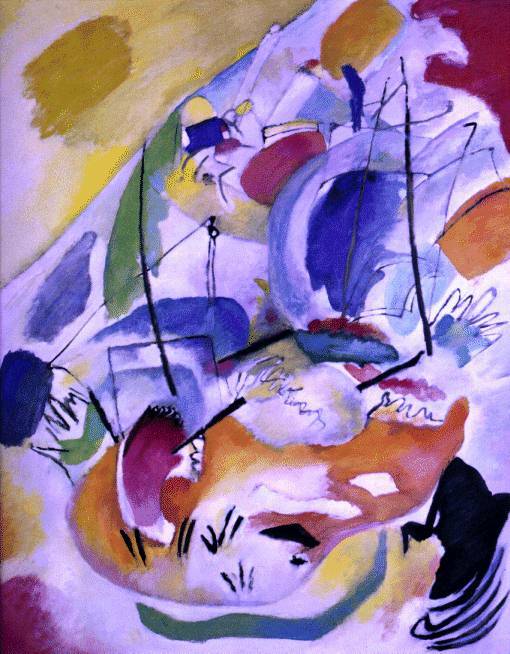 It was Kandinsky who found that the ``interior necessity'', which alone could inspire true art, was forcing him to leave behind the representational image. He was a Russian who had first trained as a lawyer. He was a brilliant and persuasive man. Then, when already in his thirties, he decided to go to Munich in 1897 to study art. By the time Der Blaue Reiter was established, he was already ``abstracting'' from the image, using it as a creative springboard for his pioneering art. Seeing a painting of his own, lying on its side on the easel one evening, he had been struck by its beauty, a beauty beyond what he saw when he set it upright. It was the liberated color, the formal independence, that so entranced him. Kandinsky, a determined and sensitive man, was a good prophet to receive this vision. He preached it by word and by example, and even those who were suspicious of this new freedom were frequently convinced by his paintings. Improvisation 31 has a less generalized title, Sea Battle , and by taking this hint we can indeed see how he has used the image of two tall ships shooting cannonballs at each other, and abstracted these specifics down into the glorious commotion of the picture. Though it does not show a sea battle, it makes us experience one, with its confusion, courage, excitement, and furious motion.